Go Shuck An Oyster: How was your Monday Night? 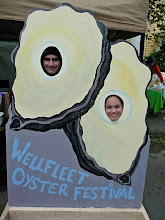 If it involved oysters, beer, great people, raising money, and a classic shuck off, I bet it was a great night! On Monday, February 23, 2009, Shuck Off!, LLC, held a gathering for oyster lovers to benefit the Massachusetts Oyster Project. The event was held at Tavern on the Water in Charlestown, MA. For a $10 donation guests received two tickets that could each be traded for 1 beer or 4 oysters. As you might imagine, the night didn't end before a classic shuck off. The packed crowd enjoy the event but those who arrived early enjoyed it the most as the 400 oysters donated by Island Creek Oysters went quick. If you've had an oyster from Island Creek in Duxbury, MA, you can understand why these went so fast. The next time you hear about Shuck Off! putting on an event, check it out! This is a fun group of people who are trying to make a positive difference in the world of oysters. Be sure to spend a few extra dollars on a clever t-shirt as they donate some of the profit to the Massachusetts Oyster Project. I look forward to posting information on the upcoming events associated with Shuck Off!. Stay tuned and see you there.